Looking to emerge from Maruti's giant shadow in India, Japanese two-wheeler maker Suzuki Motorcycle India Private Limited (SMIPL) has turned to Salman Khan to create an awareness for the brand ahead of the launch of its first commuter segment mobike Hayate next month. Suzuki is set to initiate a massive brand awareness campaign to up sales in the world's second largest motorcycle market. The company has signed actor Salman Khan as brand ambassador to increase the visibility in the country. 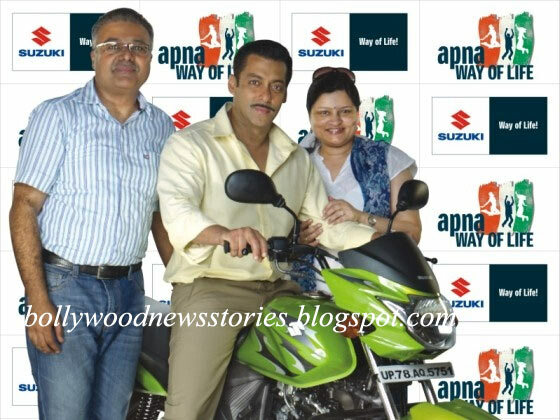 Salman's association with SMIPL will begin with the endorsement of Hayate 110 cc with which Suzuki is looking at foraying into the seven million-strong mass commuter segment in India. The Hayate is scheduled for launch later next month and will take on best-sellers such as Hero Splendor, Bajaj Discover and TVS Star City. Suzuki currently has limited presence in the motorcycle industry in India with GS150R and (150 cc) and Slingshot (125 cc). It has a market share of less than one per cent.